I received this flexible solar panel from Lensun Solar for review. While I don't usually agree to do many product reviews, I was very interested in one feature in particular of this Lensun panel. The surface of the Lensun panels are quite different from other flexible solar panels I’ve installed. It has kind of a rubber like textured feel to it that I really like. The added traction makes me feel a little safer walking on it. This is certainly important when walking around my roof in the morning or after a bit of rain. I have two other 100 watt mono panels as well that have more of a shiny gloss finish and I am always cautious when walking on them when the roof is a little wet. That is not the case with these. Once Lensun notified me that the panel had shipped, it arrived within a week. That was much quicker than I expected given that Lensun is located in China. As it turns out, they ship from within the U.S. and U.K. so it arrived at my door promptly. The package was clearly marked “Flexible Solar Panel” on the front and it was double boxed. After removing the panel, I took a close-up look at the ETFE material that gave it that rugged feel. I did some research and found that Lensun solar panels are used fequently for marine applications and are designed to withstand the harsh conditions sailboats encounter at sea. At first glance, that seemed to me like it would be true. Lensun has two types of 100 Watt mono crystalline flexible solar panels. Both panels come with the new ETFE coating and the power output specification are the same. The main difference between the two are that one has an aluminum backing and the other one (the black one) has a fiberglass backing. Attached to the panel’s junction box is five feet of cable with MC4 connectors so connecting it to my other panels was not going to be any trouble. But before taking it up to the roof of my RV, I went through some routine testing to confirm its power output capabilities. I tested the open circuit voltage (Voc) and short circuit current (Isc) on a moderately sunny day and the numbers met or exceeded the ratings on the back of the panel. The panel is rated at 5.89 max amps which is standard for 100 watt panels. I hooked it up to a 210 amp hour deep cycle battery and it charged at the expected level between 5.6 to 5.8 amps. 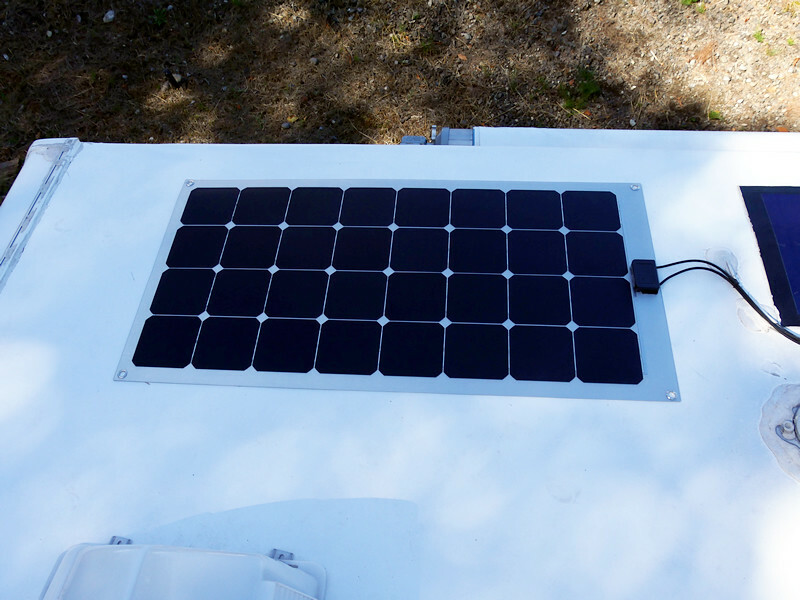 The panel performed well when wired in series with the rest of my RV solar array. 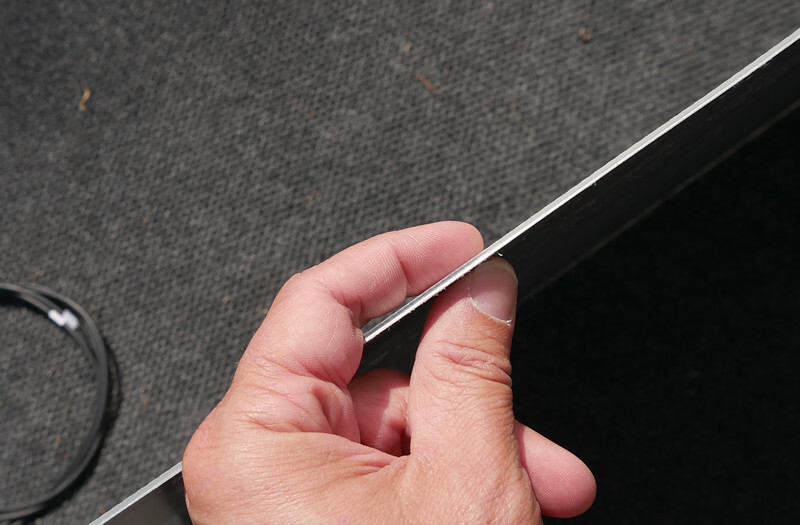 Another feature worth mentioning is the aluminum backing. This is not common in other flexible panels I have used. The aluminum backing is supposed to help dissipate the heat away from the solar cells. I was not able to see a noticeable difference between this and the other panels I tested. Perhaps the aluminum backing would have more effect when mounted on the metal roof of a car, van or camper. Lensun also makes an attractive black 100 watt panel with a fiberglass backing which is a great panel for non-metalic RV roofs or sailboats. 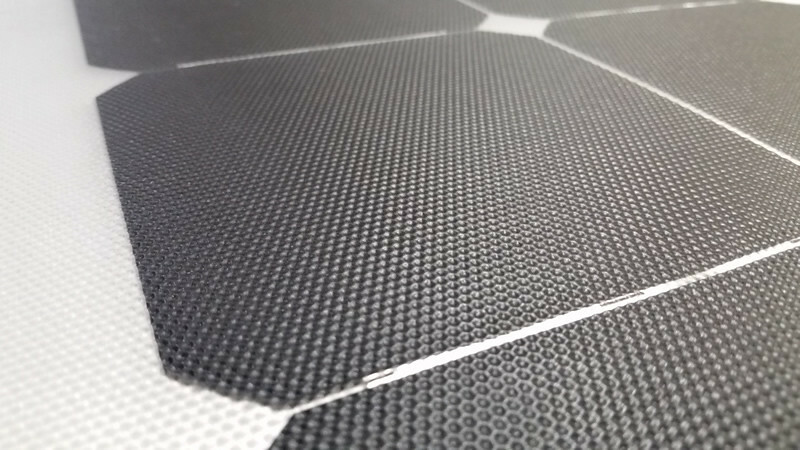 Overall, it’s great to see some fresh technology from Lensun in the flexible solar panel market. 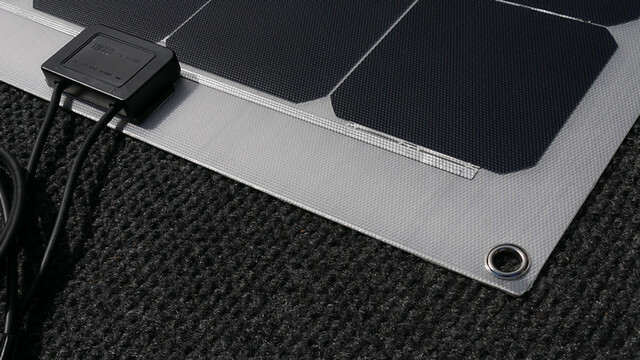 I have always thought flexible solar panels were well suited for RV applications. Thin versatile solar panels like these offer the same power as comparable rigid solar panels at a fraction of the weight. I’m excited at the new options in solar that are available today and can’t wait to see what is coming next.